Rugged São Miguel coastline, Azores. You’re excited to visit Portugal but can’t decide whether to visit the Azores or Madeira. Both are amazing islands off the coast of Portugal with a mild climate, lush green hills and fabulous Portuguese food. It’s possible to visit both the Azores and Madeira in one trip (there is a direct 2 hour flight from São Miguel, the Azores main island) to Madeira on TAP Air Portugal, but if you’re limited by time or logistics, here’s our take on whether the Azores or Madeira is the best destination for you. THE CONTENDERS: AZORES OR MADEIRA?  The Azores are an archipelago of nine islands 1,000 miles off the coast of Portugal. São Miguel, the main island (and the one we focus on for this post) is the biggest (spanning 40 miles x 9 miles) and most populated (140,000+ residents) in the archipelago. 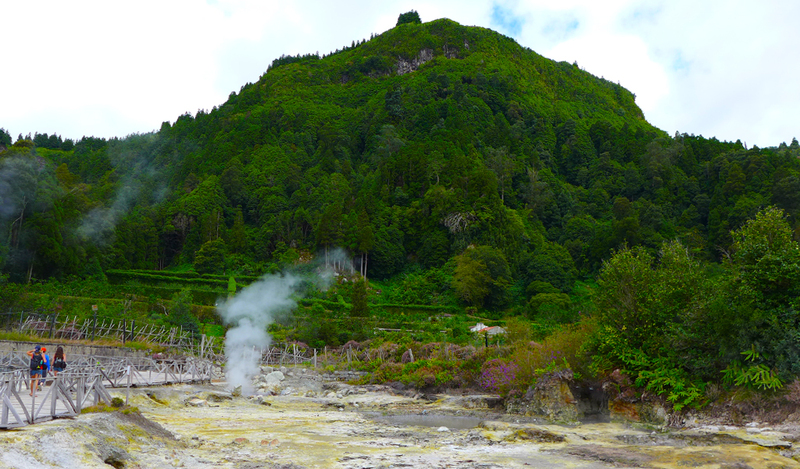 São Miguel is known for its crater lakes, bubbling hot springs, black sand beaches, and stunning hiking routes. The island is also home to Ponta Delgada, the largest city in the Azores, filled with tasty restaurants and charming cobblestone streets.  Madeira lies 669 miles off the coast of Portugal. The island, 35 miles long and 13 miles wide, is best known for its majestic mountains and winding levadas (irrigation canals) as well as its rich cultural offerings in Funchal, the main city (think museums, galleries and gardens). There are no natural sandy beaches on Madeira, so folks head for the sister island, Porto Santo, by ferry for proper beach days. Hi, I’m Lids. I’m a U.S. ex-pat who lives in London and who has traveled to both the Azores and Madeira. I’ve spent five days driving around Madeira and made 2 trips days long trips to São Miguel, Azores. I’ve also traveled across mainland Portugal – everywhere from the vineyards of Douro Valley, to Lisbon, Porto, the beaches of the Algarve and beyond. Portugal is one of the most beautiful places in Europe and the country’s islands are it’s hidden gems. 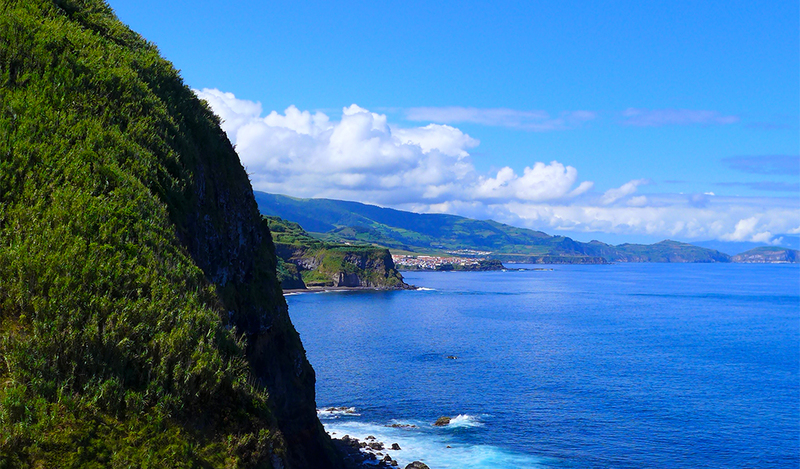 If you want an wild and rugged destination, head for São Miguel in the Azores. Azores tourism is still in its infancy, so there’s plenty of room to go off the beaten track and explore. Get there before the crowds. The island is also volcanically active – there are lava fields, hot springs, crater lakes and fumaroles. Locals feast on cozido, a meat and vegetable stew, slow-cooked by steam underground. São Miguel is surrounded by gold and black sand (and pebble!) beaches and there are incredible thermal pools for soaking. Our favorite pools include Don Beija in Furnas and Caldeira Velha in Ribeira Grande. The island is filled with hiking trails (maps can be found here) and pristine lakes for SUPing, kayaking and canoeing. 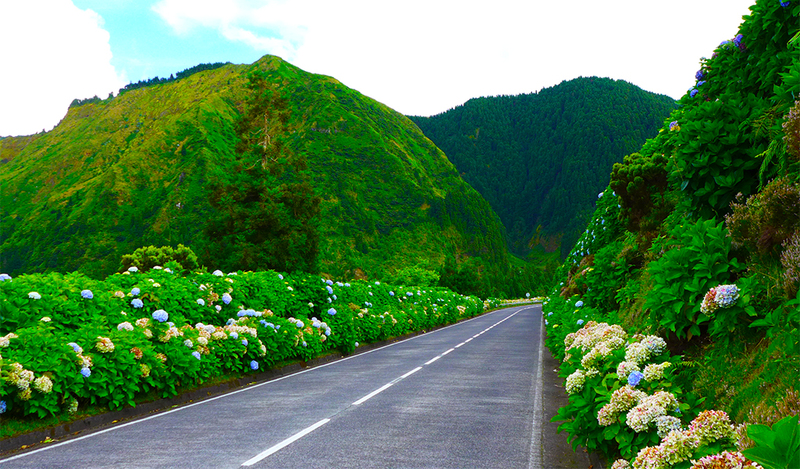 In short, the Azores are an eco-paradise. But if you’re looking for an island that welcomes tourists with open arms, head for sleek and refined Madeira. Things are mellow, there is no volcanic activity, but plenty of five star hotels (see Reid’s Palace and Quinta da Casa Branca) and fancy dining spots. Madeira has the legendary Museum of Contemporary Art and the hip Madeira Film Festival. There are manicured botanical gardens and you can spend the afternoon sitting in a toboggan, getting pushed down Funchal’s hills by men wearing fancy white suits. Hiking, while amazing for those who make the effort, is optional. 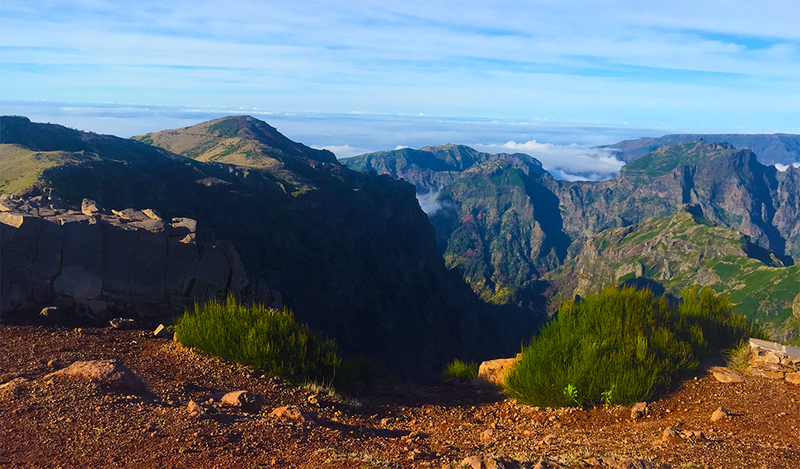 You can simply drive into the clouds and to the top of Pico do Arieiro, the island’s third highest peak. If you’re a carnivore who likes cheese, it’s no contest, head for the Azores. São Miguel has more cows than people and the steaks are out of this world. Dine on medium rare tenderloin steak with three pepper sauce, potatoes and red wine at Restaurant da Associação Agrícola, it’s heaven. The Azorean cows also make legendary cheese. Queijo São Jorge is the most well-known cheese, produced on the nearby island of São Jorge. This cow’s milk cheese is semi-hard and holds a protected geographical status certification, indicating superb quality. Once you’ve eaten enough steak and cheese, move on to something sweet, the local, small and sweet Azores pineapple, grown on Sao Miguel plantations. If you’re into gourmet meals and Michelin stars, Madeira is your spot. Head for Restaurant Vila do Peixe where the catch of the day is spread over ice and you can choose the best type and size fish for you. Or pop over to one of the island’s Michelin-starred places, Il Gallo d’Oro and William. Wherever you end up eating, don’t miss eating limpets (ocean snails that look and taste like clams) in garlic butter sauce and drinking vinho verde (our favorite white wine, especially the bottles produced by Quinta de Azevedo). 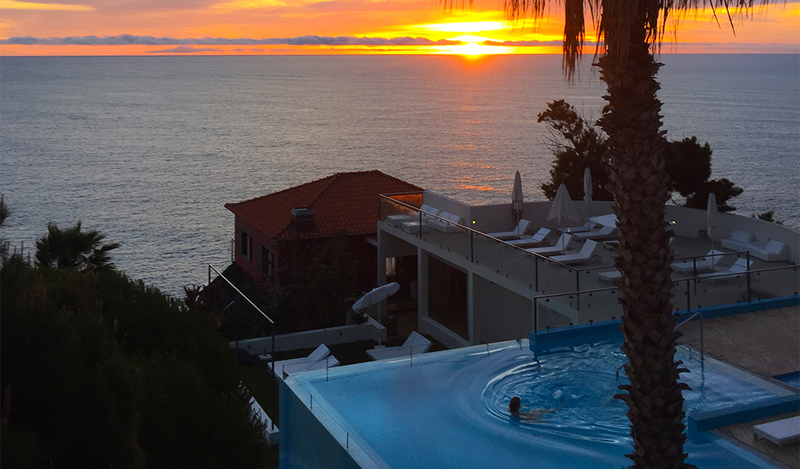 If you’re looking for a ton of evening activities (dancing, bars, nightlife), then head for Madeira. There is over the top dancing at Vespas Club and a rowdy bar scene at FX Sports bar. You can also stroll around old town Funchal, talking in the sights and popping into one of the various cafe/bars like Barreirinha Bar Café or Venda Velha (the local poncha drink is a must, its a mix of distilled sugar cane alcohol, honey, lemon juice). For classy drinks, get a glass of wine at The Wine Hotel. In São Miguel on the other hand, you’re best bet is watching stars over a bottle of Portuguese red wine. That or a chill drink at the Azor Hotel or Grand Hotel bars in Ponta Delgada. Occasionally, dancing at Arco 8, warehouse/art gallery/space. If you’re coming from North America, the Azores are easier to get to. It’s about a 4.5 hour direct flight from the east coast’s of the U.S. and Canada. There are no direct flights from North America to Madeira, but there are more direct flights from Europe to Madeira than there are from the Azores. And if age is just a number, know that Madeira gets a ton of older folks visiting from Europe. 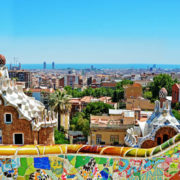 Known as the island of eternal spring, British, German, French and Spanish retirees flock to the island in droves (because mild climate, gorgeous views, amazing food and fancy hotels). So don’t be surprised if you see more older travelers in Madeira compared to the Azores. Stylish hotel in Madeira, the Estalagem Da Ponta Do Sol. Geothermal activity in Sao Miguel, Azores.